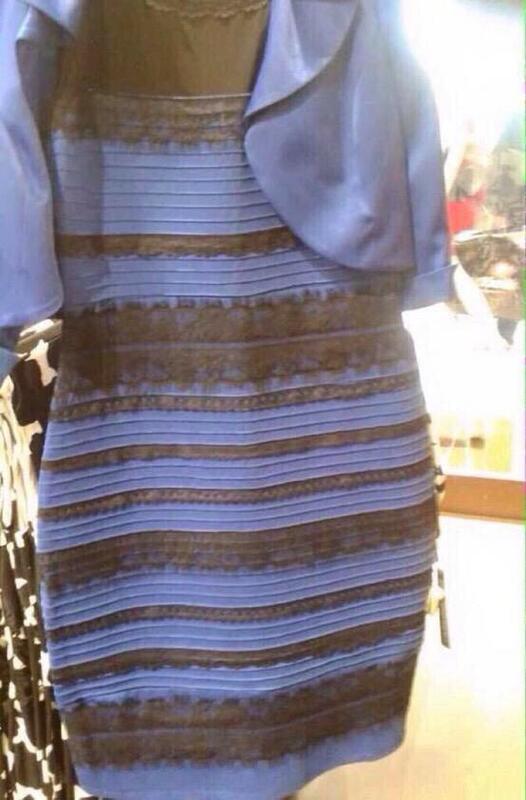 Let me come out and express my biases out front: I always believed the dress was blue and black—or blue and brown. My co-workers can attest to that. But after talking to a couple of people who understand the way we—and the way cameras—see light, I understand why some people saw it as white and gold. It comes down to the color of the light source in the photo. What color is that light, and how is it affecting the color of the dress? When we look at the photo, we know instantly that it looks different from the way the dress would look in real life. The background is very bright, and as a result, we have few hints about what the photo’s light looks like in real life. The light could be orange like a living room or a streetlight, or it could be blue like sunlight or a daylight bulb. Some of us subconsciously decided the light was orange; others decided the light was blue. Which color we chose affected our perception of the color of the dress, on which that light was shining. That subconscious choice nearly tore us all apart Thursday night—it might have broken up Kimye. Our brains make these unconscious choices all the time. Think of a white piece of paper under a streetlight; it might look orange. But in this case, we know the paper is white to begin with, and that it’s being lit by orange light. We know a lot more in that situation than we did with the picture of the dress. That is, if we know the paper is white to begin with, we know the light is orange to begin with, and we’re not confused if the paper looks a little orange. Unfortunately, cameras aren’t always as good at compensating for different-colored light as we are. In the picture of the dress, the background is blurry, and the color of the light in the picture of the dress is ambiguous. Our eyes don’t like ambiguity; they need to make a conclusion about what they see. Some people might be subconsciously deciding the light is blue. To these people, they see blue light shining on a white dress, attributing that blue—that others saw in the dress—to the blue of the light. Similarly, these people saw the black parts of the dress as blue light shining on gold—a color similar to orange. Other people like me saw the light as orange. So we attributed the blue in the dress to the dress—not the light. And I attributed the orangey black of the dress to orange light shining on black. Thursday night, the fact that the dress was blue and some people saw the light as blue drove everyone mad. If the dress had been any other color that was not similar to the color of the light (to some)—or more importantly, if it had any more distinguishing colors in it other than black—the color of the dress would not have been so ambiguous. If the black parts of the dress were red or green, our brains might have been able to correctly—and uniformly—attribute the color of the light source right away. But that’s not what happened. There was no color to help us distinguish the light from the dress. That drove us mad. It nearly tore us asunder. Thankfully, we all made it through. My relationship is intact. Kimye endures. Read more of Slate’s very comprehensive coverage of The Dress.